My pedometer reads a hair shy of 19,000 steps as I sit down in the Salon de Fumadores in the LCDH of the Hotel Nacional de Cuba, and it is just about 7:00. I have had a full and excellent day, and i have several hours to kill. Because of an event I was invited to, Liza and I opted to meet on the patio here at midnight. It would be no hardship to sit on the patio for that time, but because I want to write about the stores, I decided to spend an hour here… maybe two. As I sat down I was ready to finish my fifth cigar of the day, and I am not nearly done. This has thus far been, by any measure, a great day for a cigar lover like me. I was greeted as I came down the stairs by the lovely Tanya and Ernesto. This is probably my tenth time in the store, and finally Tanya remembers me. I did not expect that, especially since it has been nearly nine months since my last visit. I was pleasantly surprised. I was also pleasantly surprised by the wide array of singles available, which made up for my friend Lazaro having left early. Lazaro is the resident cigar roller here, sitting at his table at the top of the stairs. I don’t know if I will be back here this trip, but I have plenty of custom rolls from Alejandro and Juanita to keep me satisfied. After a few minutes of deliberation, I selected a Montecristo Open Eagle for this evening’s first smoke. I am sure my doctors, one of whom I spent the morning with in Habana Viejo, would frown upon the sheer quantity of cigars I am going through today. Fortunately they are not here, and can chastise me should they ever read this article. The Salon de Fumadores (Smokers Room) is very well appointed, with two distinct seating areas and a bar. Like most others, the walls are adorned with photographs of famous historical cigar smokers. Winston, Groucho, The Governator, Orson, just to name a few. The staff was apologetic that there was no service this evening, meaning if I wanted a drink I would have to go upstairs. The TV is playing a concert of Cuban music – maybe Buena Vista Social Club? – and I have been drinking all day. I am fine waiting another hour before my next drink. I just wanted a place to sit, smoke, relax, and write. Several paragraphs on I had to come back to add that Tanya and Ernesto joined me for a few minutes, pouring a Havana Club 7 anõs for me. I may not have been planning to drink, but boy did they pick the right rum to pair with this cigar. It does not have the caramel and chocolate of the Union, but it complements beautifully the creamy pepper of the cigar. If they keep treating me like this… I may well never leave! The wicker chairs in the lounge are starting to show their age, but they are still very comfortable. Behind the wall to my right, there must be a service area for the restaurant upstairs; you can hear the bustling of workers preparing meals (I assume). It is not loud enough to be a bother, especially with the TV on the wall directly to my left. I would not be surprised if by this time next year the cushions on these chairs were replaced, but I am happy and comfortable… and this is the first solitude I have had all day. I was worried about the ventilation in this underground room at the far corner of the joint, but those concerns were put to rest as my smoke rose quickly and efficiently to the system above the bar. I have my doubts whether it would be as clear in here if all ten seats were occupied, but for my purposes I am happy. I do not remember this store having such a fine selection of cigars, but the last time I was here there was a huge group of tourists from China who had come through and decimated their stock. There are not too many Cohibas, but Montecristo, Partagas, Hoyo de Monterrey are available in most of my favourite vitolas. I have said a hundred times that if you are in Havana, you have to enjoy a drink and a smoke on the patio at the Nacional. Lazaro, when he is here, makes a great cigar, and the stock in the store is good, if not exceptional. In Canada I would expect the prices to be higher in such a fancy hotel, but that is not the case here. 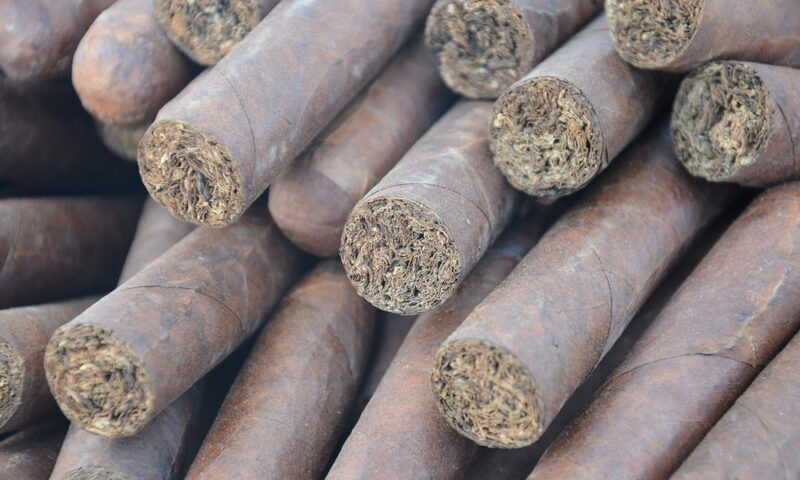 Even the cigars at the patio bar are reasonable, which is not always the case even in Cuba. If you can, come down to the store and check out what they have. If you have the time, and especially on a rainy day, the lounge is a very nice place to smoke. Next PostNext Welcome to Turquesa!